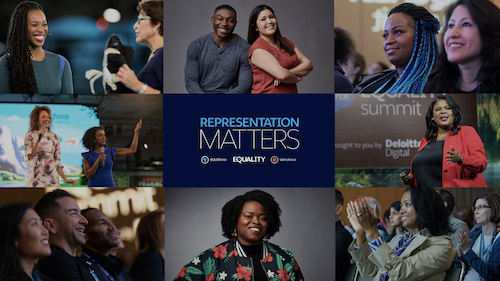 Salesforce is hosting our first-ever Racial Equality summit, Representation Matters, today, Monday, November 5th. 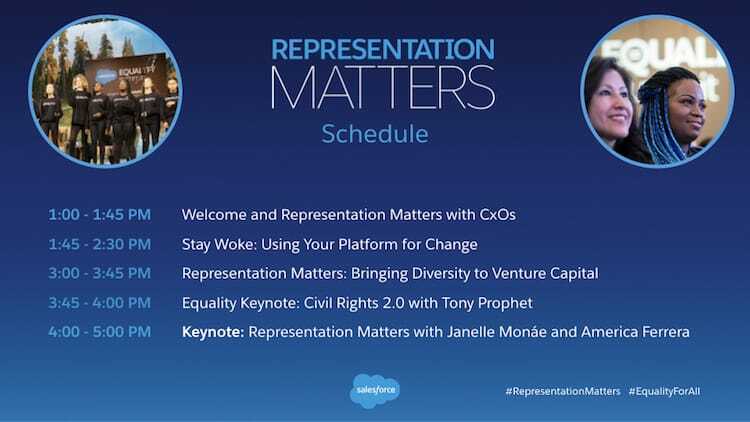 As the saying goes “you can't be what you can't see.” We know that in our tech industry Black, Latinx, and Native people have been traditionally underrepresented. But there is immense power in representation. Our vision is to elevate luminary speakers who are Trailblazers in their fields and put conversations about Racial Equality at the center. These CxOs have trailblazed to become some of the most recognizable names in their fields. 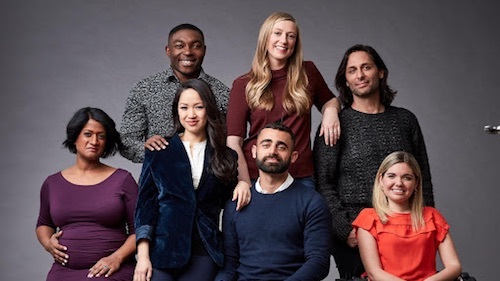 Hear about their journeys, what it means to be a role model to their communities, and how they're creating lasting impact not just in their industries but also in our society. 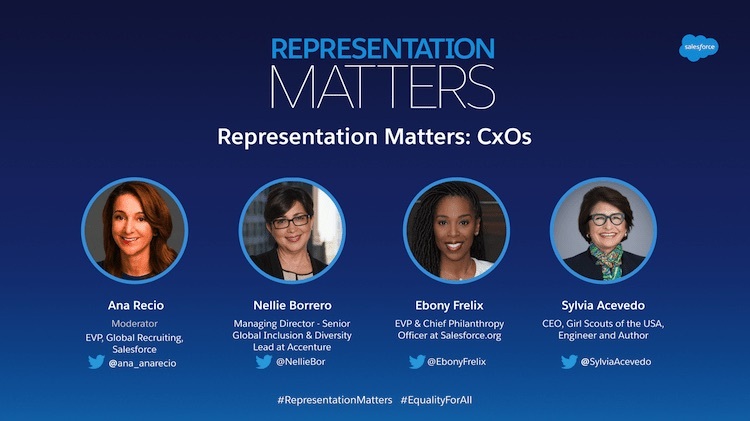 We will be joined by Sylvia Acevado, CEO of Girl Scouts USA; Nellie Borrero, Senior Global Inclusion & Diversity Managing Director at Accenture; Ebony Frelix, Executive Vice President & Chief Philanthropy Officer at Salesforce.org; and moderated by Ana Recio, Executive Vice President of Global Recruiting at Salesforce. 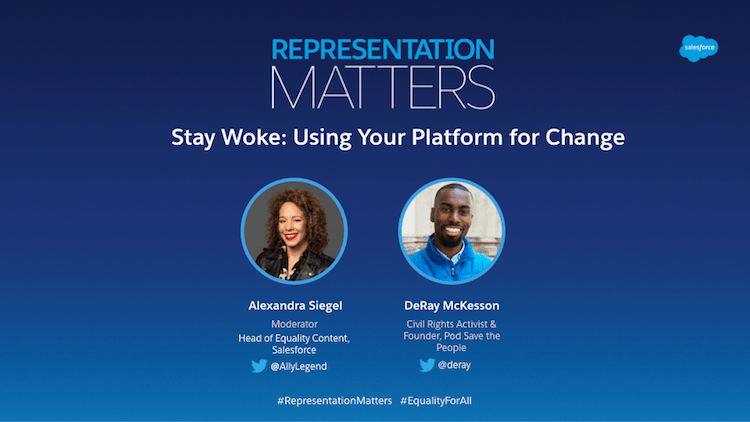 Hear from Civil Rights activist, author, and founder of Pod Save the People, DeRay Mckesson, on how he has used his experience, influence, and voice to innovate in social justice and racial equality. These leaders are diversifying and disrupting the startup and VC worlds while empowering their communities. Hear about how they've been able to build their own wealth while also building access and capital for people of color. 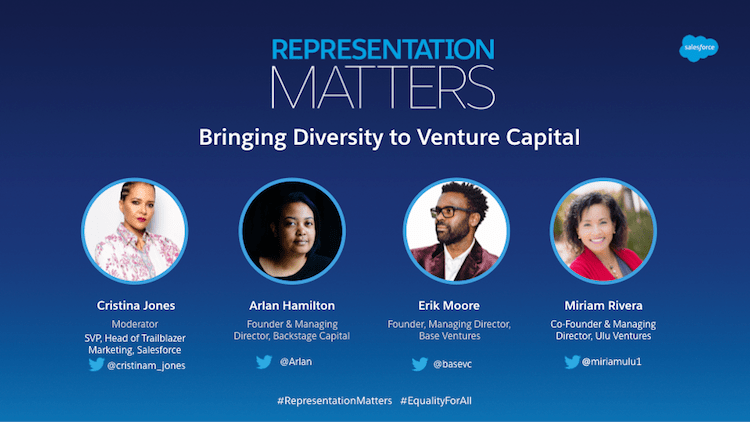 We will be joined by Arlan Hamilton, Founder & Managing Director at Backstage Capital; Erik Moore, Founder and Managing Director at Base Ventures; Miriam Riviera, Co-Founder & Managing Director at Ulu Ventures; and moderated by Cristina Jones, Senior Vice President & Head of Trailblazer Marketing at Salesforce. 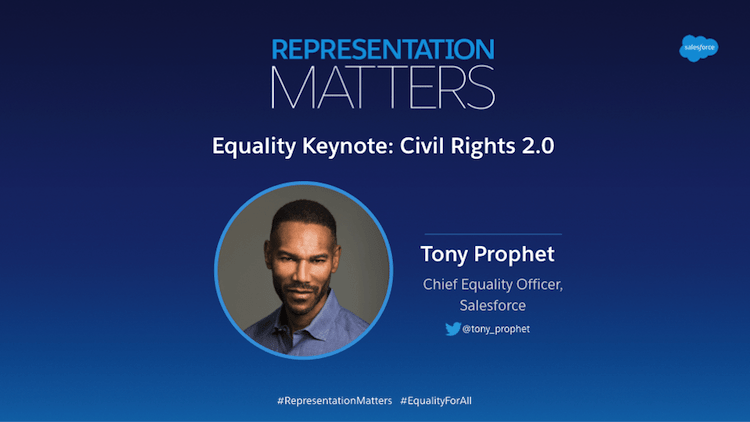 Hear from Salesforce's Chief Equality Officer Tony Prophet on how tech and businesses can help create positive social change and build a more equal world. These stars have trailblazed in their fields to become some of the most recognizable names in media. Hear about their journeys, what it means to be a role model to their communities, and how they are creating lasting impact not just in their industries but also in our society. 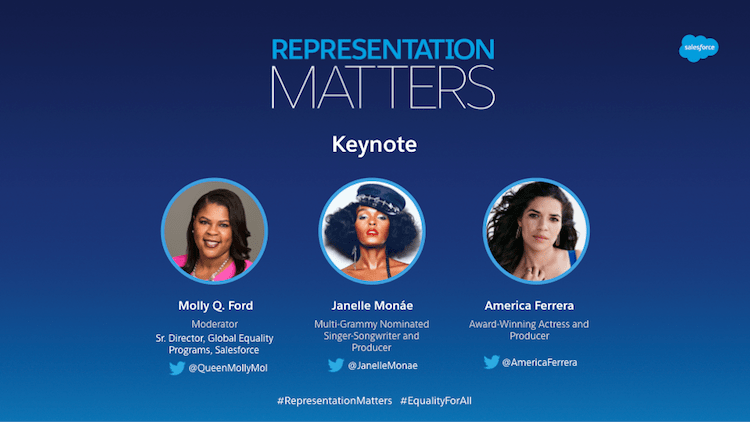 Discover and Learn: Equality and Workforce Development Expo to meet Salesforce's Black and Latinx employee resource groups — BOLDforce and Latinforce — as well as organizations like PepUp Tech. 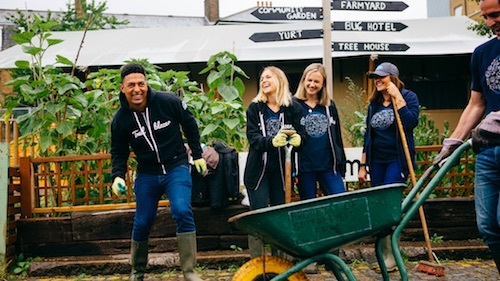 At Salesforce, Equality is a core value and we believe that every human life has equal value. 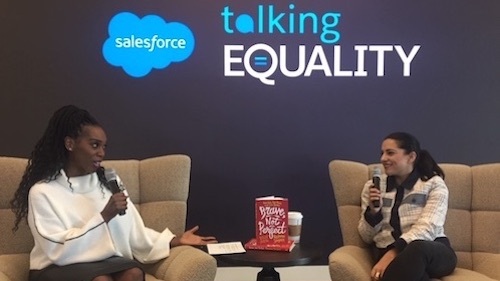 Learn more about our commitment to Equality here and follow along on Twitter at @SalesforceEQ.